We are approaching closer to UFC 217 event, where Michael Bisping will be defending his UFC middleweight title against Georges St-Pierre. Bisping seems all over the place by saying he will go up to light heavyweight to fight Daniel Cormier or might retire after UFC 217. 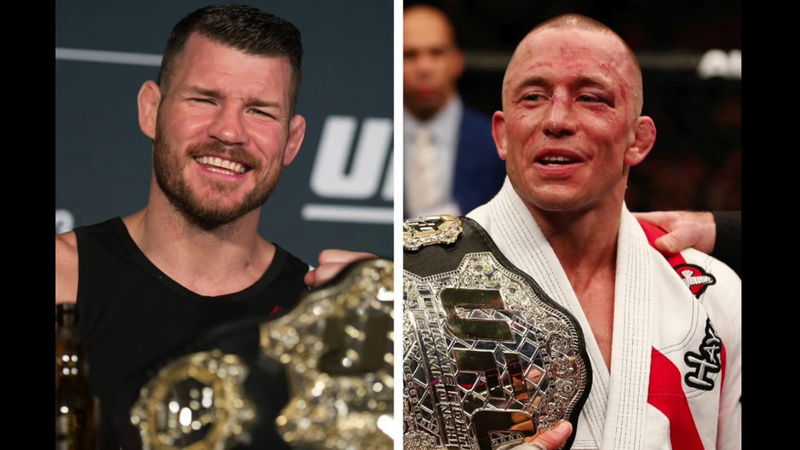 At the same time, GSP saying if loses he will retire for good, or else cementing his legacy by winning the middleweight title against Bisping and goes on to defend the belt against Robert Whittaker for his next bout. “He keeps talking about, ‘It’s in the contract. It’s in the contract that I fight Whittaker,’ but he ain’t,” said Bisping. “He ain’t gonna fight Whittaker if it’s in the contract or not. I believe it is in the contract but all he’s gotta do is say, ‘I don’t fancy doing that and if you want me to fight again and maybe sell a lot of pay-per-views, it’s gotta be someone else.’ The UFC would fold, I’ve got to imagine. “He wants to beat me, go back down to welterweight, beat [UFC welterweight champion] Tyron [Woodley], and then face [UFC lightweight champion] Conor [McGregor], beat all three, and then retire and make a ton of money. And the UFC probably wants that to happen. By that I don’t mean beat Conor, I mean beat me. Beat me, then either beat Woodley or go straight to Conor. Recently rumors run rampant on GSP and Conor Mcgregor’s fight, but GSP showed his disinterest and said not targeting for Conor fight. As Georges and Mcgregor, both are biggest stars in the history of sports. Georges St-Pierre is returning to UFC after four years of hiatus from the sport, and if win the middleweight title it will boost his legacy enormously, and it would make sense for him to look for bigger fights possible. If Conor Mcgregor fight happens in future, it will be the biggest fight ever in UFC history. “The skeptic inside me says [the UFC] probably want that to happen. If I was running the UFC, that’s what I’d want to happen. My job is to play spoiler, wreck all those plans, and beat the s**t out of Georges St-Pierre. Regardless of all the talk, GSP needs to get through Bisping first on November 4 at Madison Square Garden.